Eight famous architects monument in St. Petersburg has become a tribute to the great architects for their contribution to the city. Indeed, their role in the development of architecture of the northern capital of Russia is great. The sculptural composition now decorates the Alexander Park of St. Petersburg. 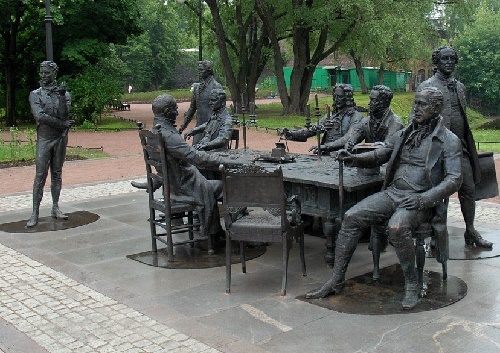 It depicts eight most famous architects: Voronikhin, Bazhenov, Auguste de Montferrand, Trezzini, Thomas de Thomon, Rossi, Rastrelli and Zakharov. The intention of the author brought them to the map of the city, and placed around their creations in miniature: St. Isaac’s Cathedral, Stock Exchange with Rostral columns and the Admiralty. By the way, one of the chairs is free. So, any visitor can sit down and symbolically participate in the discussion of the city plan. They say, that it helps those who do not have enough inspiration for creativity.